Ever since late Fedora 12 or, for sure, Fedora 13, Evolution has been annoying me. I don’t know if it’s linked or coincidental, but it appears to have started getting buggy after I noticed it was using couchdb, a database that a lot of database people in the Linux world are getting all excited about. Evolution is the Linux equivalent to Microsoft Office Outlook. I switched to it a few years ago so that I could have tasks, email, and calenders in one spot. In theory, it’s perfect – it syncs with Hotmail, Gmail, and Google Calendar. I have all my todo items in there out to April of next year. It supports GPG signing and encryption via integration with Gnome’s Seahorse keyring. In practice, it has started taking forever to start a new email or enter a new task. I click the button and then have to wait for a long time until the dialog pops up; if it pops up. A lot of the time doing this causes the program to crash. 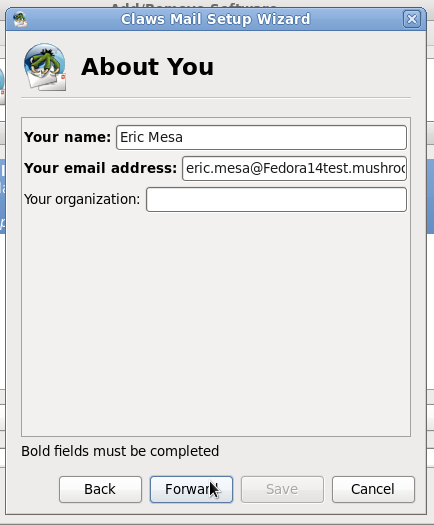 I’ve filed a bug via the auto-bug-filing program in Fedora. There’s also a bug that doesn’t bother me as much where it keeps asking me to supply the password for my Hotmail account and not accepting it until the next time I restart the program. 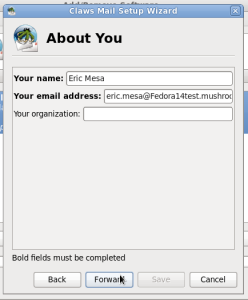 So I decided that I’d wait and see if things improved with Gnome 2.32, included in Fedora 14. For completion’s sake, I thought I’d do a bit of research and give my impressions based on experience/websites before I actually try out the email programs. This is meant to mirror what someone might do when trying to select an email program. 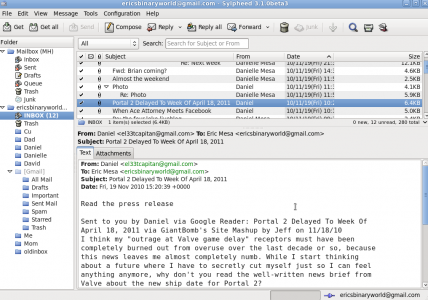 Sylpheed 3.0.3 is the latest stable release and was released 8 July. Good to see that they are still developing. My impression from a semi-recent LXF magazine was that all development had moved to Claws, a fork. From the screenshots they have posted on the site (version 2.x), it looks a bit ugly and dated. If it’s awesome enough, I don’t care – it just seems to be using an older version of GTK or something. Perhaps a problem when Gnome 3.0 comes out? The requirements page lists GTK 2.4….so maybe it’s just the icon theme the screenshot provider had? I’ll definitely have to see how it comes out when I install it for myself. They have a plugin infrastructure, but the one plugin they show is not really captivating. Taking a look at the features page shows that it supports everything I need, so i will definitely check it out. Side note, if you’re Japanese, this is probably the client for you. It’s hosted in Japan and has a host of Japanese language features they keep touting. Claws 3.7.6 was released in May of this year. It looks a bit more modern than Sylpheed. It also, apparently can have color coded folders. It has a BUNCH of plugins, some of which seem quite useful. It also appears to handle all of my requirements. I’ll definitely check it out. 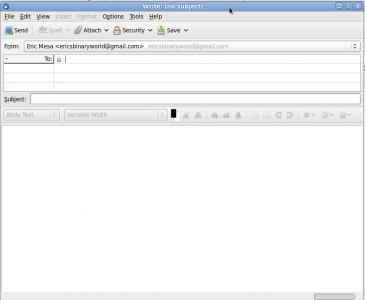 Kmail, which I’d probably use as part of Kontact (the KDE version of Evolution) was given a quick look on this blog. It supports all my key features. I will definitely give it a shot. I used to use Thunderbird because I discovered Firefox and Linux at more or less the same time. 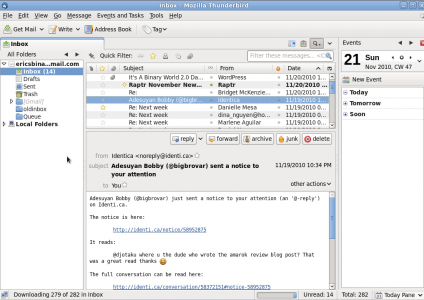 When I was looking for an email client to use, Thunderbird seemed like a no-brainer. I fully enjoyed using it in the past and only switched away from it so that I could get the full experience provided by Evolution. (the calender plugin to Thunderbird was a bit spotty at the time) It is now at 3.1.5. It had a bit of an uncertain future for a while there, but appears to be doing OK now. At first, tabbed email sounded gimmicky, but reading their description on here sounds like something I’d actually use. Awesome that they’ve added archiving like in Gmail for those who don’t put stuff into folders. Looks like you still use Enigmail to do the signing and encryption, but I’ll do some extra research to see if I can get some tighter integration with Seahorse or KGPG. Between the Lightning plugin and Sunbird, I can take care of my calenders. 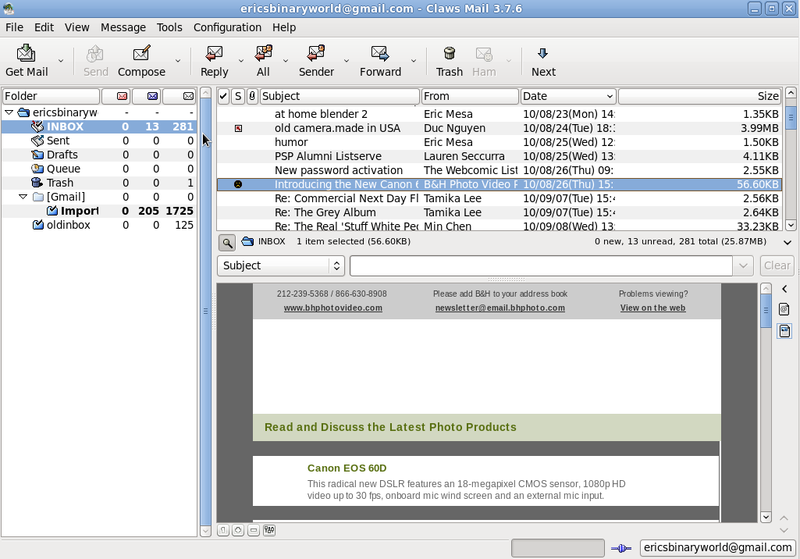 I’ve used mutt to manage my Gmail via IMAP on my laptop when I had CrunchBang Linux installed. It worked better than the Gmail website when I was in a place with wi-fi so spotty that it broke Gmail’s AJAX. I’m including it here almost as a bit of a joke in the sense that, as a last resort, I can use it instead of one of these GUI-based programs. But I don’t expect all the others to fail that spectacularly. It DOES support GPG, IMAP, and everything else I need it to. I’ve used Opera mail on my Windows computer and I really like the interface. But if I’m going to have my web browser open anway, why not just use Gmail’s interface? Since it doesn’t support GPG, I guess there ISN’T a reason. (At least for my personal circumstances) So this one’s out of contention. Finally, I read a blog post someone on identi.ca shared with me. It didn’t really apply to my situation, but it was a good read anyway. I’m going to do all of this in a Fedora 14 virtual image in VirtualBox. The first reason is so that I don’t inadvertently muck things up with the fact that I already have Kmail installed, used an older version of Thunderbird before, and have Evolution already installed. The second reason is to not end up with a bunch of extra installed stuff for no reason. While Linux tends, on average, not to be as bad as Windows about leaving files littered over your hard drive when you uninstall stuff, it’s still a pain to make sure all the old files are purged. I also decided to use snapshots in order to have a clean install for each program’s installation. So, here we go! First up is Sylpheed. I choose the 64-bit package sylpheed-3.1.0-0.1.beta3. This requires installation of the compface package. Post-installation it appears under the Internet category on the menu. It asks me to create a mailbox. 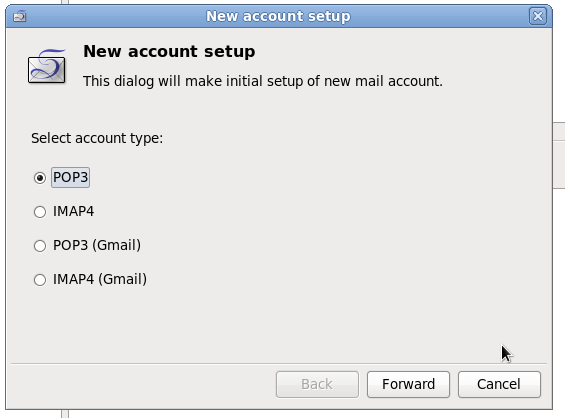 When it asks me what kind of account I’d like to setup, they have an IMAP4 section specifically for Gmail! Sylpheed - what kind of account? Pretty neat. So I select that. Then I provided my username. After that it was magically setup. After the dialog box closed, it had my gmail info and all my folders. It handles threading correctly. 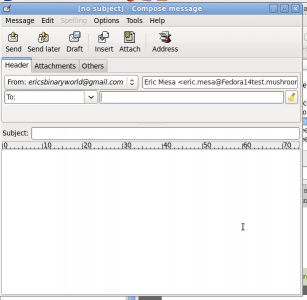 HTML messages are treated as messages with attachments. Best I can figure out is to doubl-click on it and view it in Firefox. 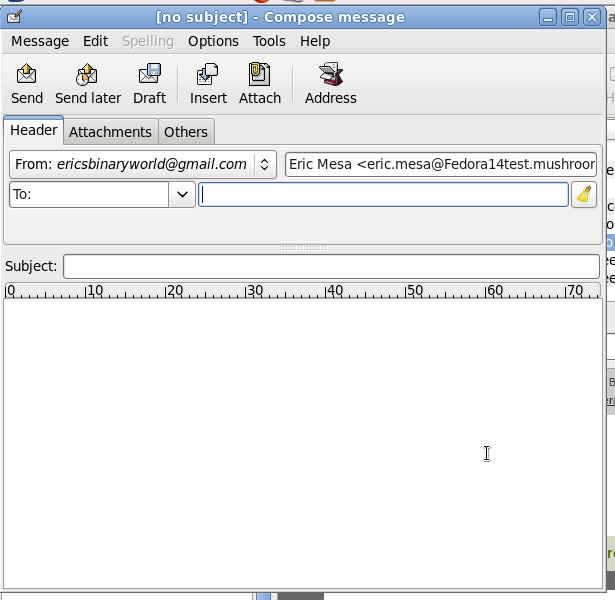 The compose window is bare, but has check-boxes for PGP sign and PGP encrypt. 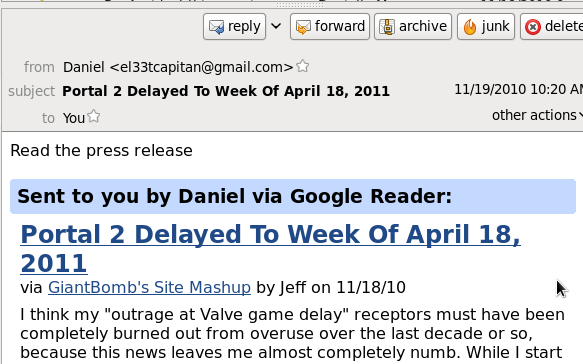 The inability to properly handle HTML mail loses it points. Overall it’s very competent; works well. It has all the features I listed above. Nothing that makes it stand out, but nothing that makes it automatically disqualified. The inability to handle HTML messages puts it at the bottom of the clients I’d consider. Time to reset the VM and start again. Ok, so this time I install Claws. It has a bunch of its functionality split out into plugins. So I also installed the PGP plugin and Webkit HTML plugin. As before, compface had to be installed as well. They start with an “About You” dialog box. Strangely, considering Claws is a slicker version of Sylpheed, there is no magical Gmail settings. So I went to the Gmail page that explains how to set this up. So after a bit of trouble it finally got my messages. HTML rendering worked a bit better, but it didn’t fetch the images. The compose window was a bit nicer than Sylpheed. The PGP options were a bit more hidden, but they were there. 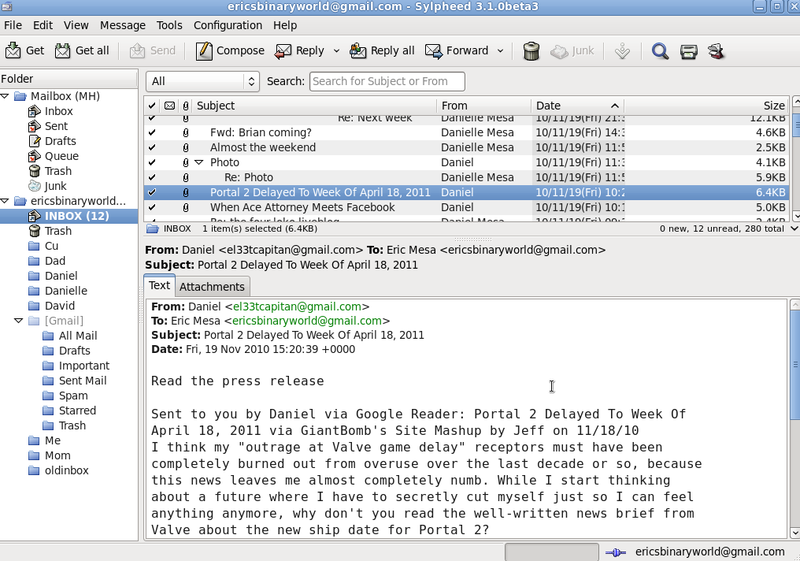 It’s better than Sylpheed (except for the Gmail part) in looks and HTML. Still not calling to me. So I reset the VM again. 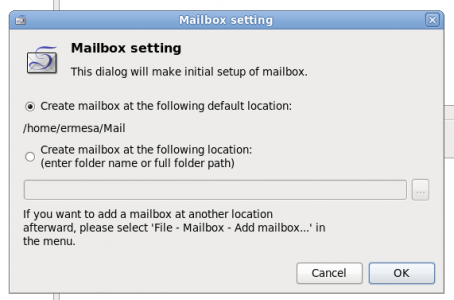 For Kmail check out this recent blog post where I went over what I thought of it as well as other aspects of KDE 4.5. So now it was time for Thunderbird, which I was very excited about. I hadn’t used it in ages. How had it evolved since Thunderbird 1? I also selected the Lightning plugin. Both of these together required a bunch of nss packages to be installed as dependencies. It asked me right away for an email address and password. Would it attempt to configure Gmail on its own? So I put in my Gmail credentials. It worked. Crazy! I think the Mozilla team has done the most innovation here. 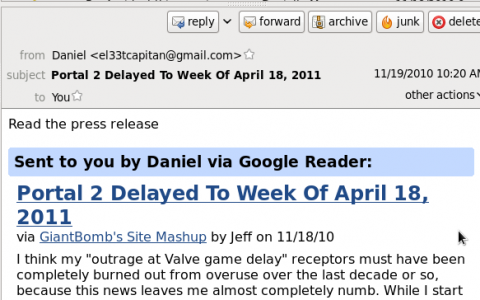 I really like the idea of tabbed email even more than I did when I first read about it. (I couldn’t figure out how it’d be useful) If threading could be configured, they’d be a strong contender. I’d say that if Evolution hadn’t started behaving itself and I was sticking with Gnome, I would definitely be switching to Thunderbird. For completeness, let’s check out mutt. Actually, I just found the instructions I used to get mutt setup with Gmail before. Yeah, that’s a lot of work when I’ve already made my choice. Over the years every year or so I do make the mistake of actually trying to use Evolution as my primary email client for awhile. It is okay, but it still does crash. I always give up on it after a very hard use over a week or two. It does not crash very frequently, but just enough to be annoying. Even worse is when you exit it and sometimes it just freezes saying formatting message. The evolution calendar also has a 5 day “week” view and I find overall worse in both appearance usability than thunderbird with lightning. 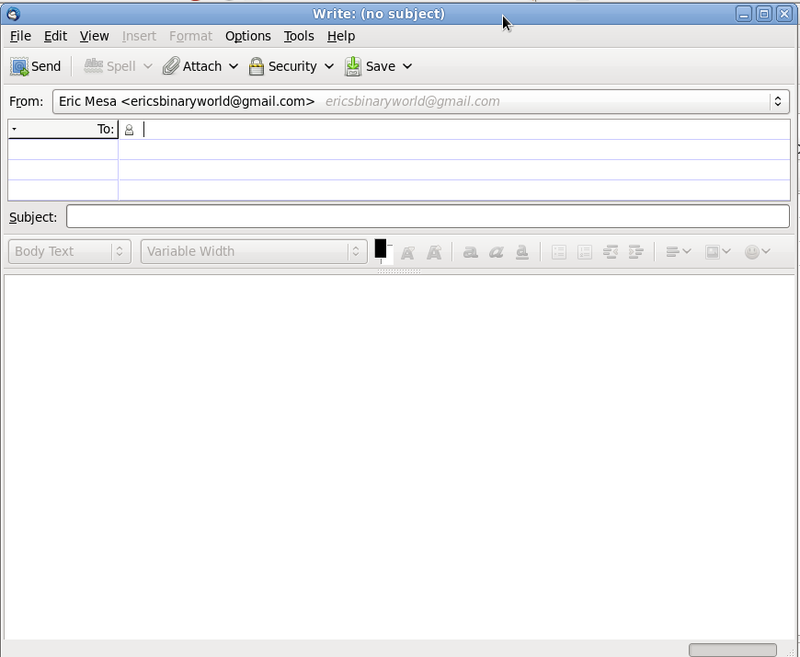 Thunderbird lightning also supports out of the box ical with write, which Evolution only does read-only. I agree Mutt is excellent when I need to ssh. 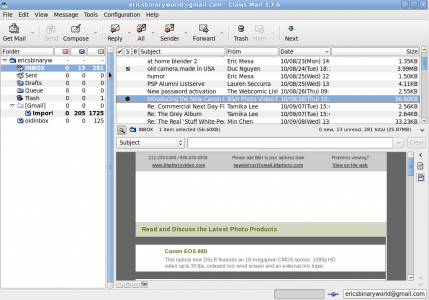 I have not tried the slypheed or claws, and if I were on KDE (I have at times been) I would certainly recommend kmail/kontact which I had used before. I would never recommend using evolution unless one is truly stuck in some regressive shop that requires exchange.